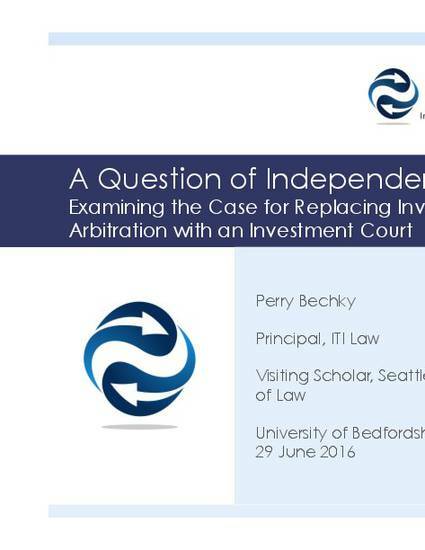 These are the slides for a presentation given at University of Bedfordshire Conference on “Rebalancing International Investment Agreements in Favour of Host States: The Case for an International Investment Court,” 29 June 2016. The case for investment arbitration rests largely on a claim of independence – on the view, that is, that a dispute between a private party and a national government should be heard before an independent tribunal rather than the national courts. This view of independence lies at the heart, for example, of ICSID’s “anational” system. Perhaps ironically, then, the case for replacing investment arbitration with an international investment court rests largely on the view that the present arbitral system is insufficiently independent. The question of independence is thus central to the debate over whether to establish an investment court. This presentation analyzes the European proposal for an Investment Court from the perspective of independence and raises the possibility that the case against investment arbitration may lie in too much independence rather than too little.